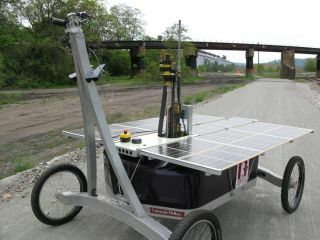 The modified Zoe rover, with the upper portion of the drill mechanism jutting above the solar array, during testing on a former industrial site in Pittsburgh. A solar-powered rover is searching for microbes beneath the parched surface of Chile's Atacama Desert, on a mission that could aid the Mars life hunt down the road. The four-wheeled rover, named Zoe, began a two-week field campaign in the Atacama on June 17. Its work could help NASA decide how best to equip its next Mars rover, which is set to launch toward the Red Planet in 2020, scientists say. Two NASA rovers — Opportunity and its bigger, younger cousin Curiosity — are currently active on the surface of Mars. While both are investigating the Red Planet's past and present ability to host life, neither robot was designed to hunt for evidence of microbes. But future rovers may well do so, and Zoe — which measures 9 feet long by 6 feet wide (2.7 by 1.8 meters) — could help scientists and engineers map out an action plan. Zoe is part of a NASA astrobiology mission that's led by Carnegie Mellon University and the SETI (Search for Extraterrestrial Intelligence) Institute and supported by a $3 million grant from the space agency. A dry lake bed in Chile's Atacama Desert. Scientists studying life in the Atacama have identified ways that microbes cope with extremely dry environments. NASA often tests its rovers in the bone-dry Atacama, which is perhaps the best Mars analog here on Earth. Zoe has been there before, back in 2005. This time around, though, it has an extra tool — a 3.3-foot (1 m) drill made by Honeybee Robotics to hunt for subsurface life. Zoe is also outfitted with a soil-analyzing instrument called the Mars Microbeam Raman Spectrometer, which could be part of a future Red Planet rover. Understanding whether or not there could be life underneath the Martian surface depends on a variety of factors, and the Atacama offers "one of the Earth’s harshest climates" for such a study, said planetary geologist Nathalie Cabrol, senior research scientist at the SETI Institute's Carl Sagan Center and the science lead for the Life in the Atacama project. Zoe is expected to cover 19 to 31 miles (30 to 50 kilometers) during its two-week field campaign and perform one or two drilling operations every day, researchers said. The current mission started in 2012, when the team went to the Atacama without the robot. Researchers drilled numerous holes and took various measurements, such as hydrogen abundance to quantify moisture and soil composition. The scientists detected microorganisms in the Atacama — and now those findings will be compared with what Zoe can do on its own. "Zoe is more autonomous that previous rovers and able to operate for days, finding its way from one goal to the next and automatically detecting features of interest that it should examine along the way," said Wettergreen, adding that the robot will work completely independently for several days at a time. Zoe will have to follow a set of pre-determined instructions about the area to cover and the data to collect each day, taking a break at night and automatically resuming work at dawn. This will allow the researchers to verify whether Zoe is indeed ready to be left all alone, Wettergreen said. "The greatest challenge is in the integration of robot, mechanisms, instrument and software," he said. "Each piece may individually work, but to have everything cooperating and functioning unaided in the field requires significant effort and continuous refinement and improvement." Follow Katia Moskvitch on Twitter. Follow us @Spacedotcom, Facebook and Google+. Original article on SPACE.com.